Awesome! I hope it is a Roy with included boobie ducks! And I hope I get it before it sells out! 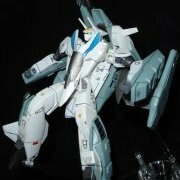 Sorry if this was already asked but do we know if they will release a VF-1S version? I would love a Regult Scout too! Have any of you quit collecting? I have quit collecting several times and have tried selling off my whole collection several times. Almost always because of money issues. But then I end up not being able to sell everything off and then something really cool comes out and I end up buying it. However, over the years I have gotten better and better at buying less and selling more, and not collecting. It actually feels good to let go of these things. I am planning to have a garage sale soon to sell off all the things I have not been able to sell on eBay and then all I will have left is my 1/55 VF-1S with super parts which is the only toy I plan to keep "forever" (that and my Tron lightcycle that I have had since the 1980s). That said, the new Bandai 1/48 VF-1 looks amazing and if they made a VF-1S Roy then it is possible that I might get one of those if I was able to afford it. Collecting is fun but it takes a lot of time, money and space and those things have become more valuable to me over the years for more important things. Maybe eventually I will even get rid of the Tron light cycle and the 1/55 chunky monkey. I must have this so I just bought one from Anime Export. I saw Kong Skull Island with my son on Saturday and we loved it. He said it is his favorite movie ever! And yes, definitely stay through the end of the credits. Nice little teaser for where this is going next. Macrossman was a great guy. He is missed. Too bad they did not use those colors on the VF-0D. That would have looked much nicer. But a hot pink VF-1S? That would be awesome! I could put hello kitty stickers on it in place of the macross kites. I am hoping that this may also lead to a reissuing of the stand-alone 1/60 super/strike parts. I really want a set for my arcadia 30th anniversary VF-1J. miriya replied to Nyankodevice's topic in The Workshop! This is so beautiful! Great work!